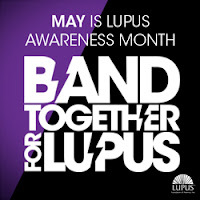 I want you to imagine with me for a minute what would happen if lupus turned its patients purple. Bright, vivid purple. If each and every one of us had some visible sign that we were well and truly sick. What would change? 1. We would no longer hear those despised words, "But you don't look sick." Because, you know, we would. 2. People would know what lupus is. You can't have 1.5 million purple Americans walking around without people noticing something is up. 3. Because of #2, strangers would be less likely to leave passive aggressive notes on our cars about how we should leave handicapped spots for people with "real" disabilities. 4. Doctors would no longer dismiss our illnesses as being "all in our heads." Because purple. 5. The complete absence of a cure would suddenly be noticed. Because once purple, always purple. 6. The fact that lupus is relatively common would suddenly be obvious. 7. It would be easy to find lupus support groups. 8. Supporting Lupus Awareness Day would be super-easy. 9. We wouldn't have to explain to everyone that we're not flaking out, we really are sick. 10. We wouldn't have to wait, on average, six years for a diagnosis. Ok, so this is obviously a silly thought experiment, but I just wanted to make the point that many of the problems that we struggle with come from the fact that lupus is, by and large, an invisible illness. People were a lot more understanding when I walked with a cane then they are now that I look totally normal. And to you healthy people out there: just imagine how you would react if everyone with a chronic illness turned colors. Then realize our disease is just as real as if we did. That would certainly turn heads! Well said! Newly diagnosed after 3 years of symptoms. I have come to not even telling people or discussing it. I either get "you don't look sick/well it could be worse/you don't eat right (I'm a vegetarian)/ you need essential oils/ omit gluten/ and my all time favorite..."your getting old and that's what happens...." (I'm 45). OR get completely ignored then bombarded with their "issues." (Yeah..my knees bother me too). It's exhausting. My spouse and family are great. It's mostly "friends." I'm glad I found this site. Thank you.